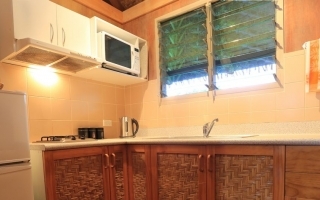 Right on Muri Beach, a winding pathway connects our 5 self contained and distinctly polynesian styled bungalows, complete with your very own patio. 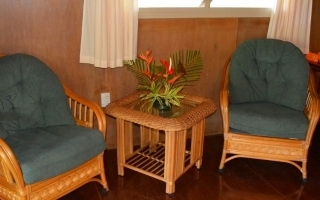 Each bungalow is set admist beautifully landscaped gardens and natural surroundings. 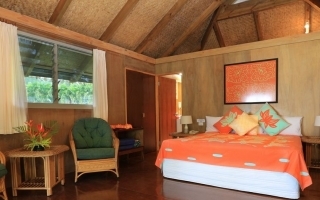 Our three beachfront bungalows are uniquely positioned offering spectacular views of the lagoon, and our two Lotus Bungalows offer a more private escape by the lotus stream. Our outdoor pool is close by and central to each bungalow, making it a great place to relax and unwind. 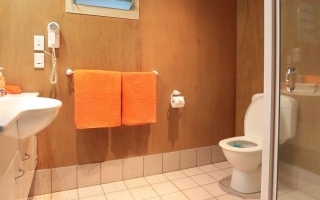 Maximum number of two guests per bungalow. All beds are super king and can be split into two king singles. Open plan living area, with kitchen and furnishings designed to provide you with a totally relaxed stay. 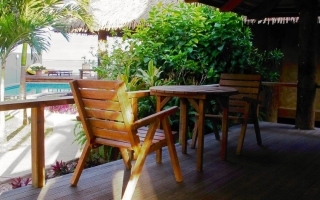 A generous private patio has outdoor furniture for dining.